North Georgia is very unique when it comes to honey bee removals. Of all the places I remove bees, it happens to be my favorite place to go to. I am based in Fayetteville, GA, just south of Atlanta, and it is nice to be able to get away from the busy city to the peaceful mountains. I love the mountain views and the cooler weather which is usually 10 degrees cooler than Atlanta on a given day. The fall colors are gorgeous and I also love the wildness of north Georgia. Bees thrive in north Georgia due to the vast wooded areas and the two seasonal nectar flows. Many areas further south have only one nectar flow in which the bees are able to make any surplus honey. In north Georgia however, honey bees make nearly twice the honey with both a wildflower nectar flow and sourwood nectar flow. 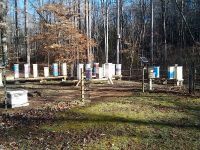 Honey bee companies further south, often move their hives into the north Georgia mountains in the summer to take advantage of this additional delicious sourwood honey harvest. My twin brother, Caleb, is a beekeeper who lives in Blue Ridge GA. I learned from him that keeping bees in the mountains has a distinct challenge from other places. Can you guess why? It is because of black bears! They love honey and bee larva. One time, Caleb had a bear come into his bee yard and do a little damage. He said it was an inexperienced bear because it had only done a little damage. Soon that black bear would be back and being more confident could do considerable more damage. Now my brother has all his bee yards surrounded by electric fences and has not had any more encounters with bears. Below is an account of the one time I ran across bear problems at a honey bee removal job. Check out this crazy bear story. Once upon a time, there was a bear that lived in the mountains of north Georgia in the city of Clarksville, and it was very hungry for some honey! Yes, Joshua got a call and the owner of this cabin said, a bear had been clawing at the front door (!) of the cabin, trying to find the honey from the honeybee hive that had made its home in the mountain cabin! Here are some photos of the bear claw marks on the cabin! and here is the honey the bear wanted! Joshua removed the honey, comb and bees, safely rescuing and relocating them to his local bee yard! Southeast Bee Removal services all of north Georgia including: Canton, Cartersville, Cedartown, Rome, Jasper, Dalton, Ellijay, Blue Ridge, Blairsville, Helen, Gainesville, Lake Hartwell, and the surrounding areas. If you are in need of bee removal services please contact us today. We will be happy to help and to provide you with a free bee removal estimate!